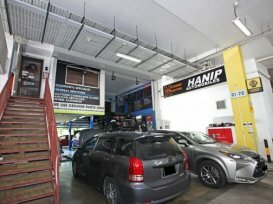 Hanip Automobiles is one of few successful workshop in Singapore which is owned and operated by a former diagnostic specialist and master technician. Established for over 10 years, Hanip Automobiles has won numerous awards and has been continuously striving to be on the forefront of the automotive service industry by regularly updating their workmanship skills and obtaining the latest equipment. The services provided ranges from general car servicing, diagnostic troubleshooting, accident claims/repairs to battery/tyre replacement. They specialize in Japanese cars, especially with Toyota and Lexus. Pre-Service as well as Post-service consultation, by Hanip himself, are provided to ensure that customers are kept informed throughout the process and satisfied with the service(s). Hanip Automobiles adheres strictly to the usage of genuine parts only. Hanip Automobiles is run by a former technician from Borneo Motors and thus can be assured of quality workmanship for all Toyota or Lexus models. Most reliable and trustworthy workshop.